this is release of my new resource - Inventory HUD for ESX. You have to edit es_extended to remove default inventory on F2. Check install instructions on Github. I will not add drag and drop system. Please don’t ask me about it. There is literally no reason for it, because right-clicking items is just faster and better. If you want it, then make it. 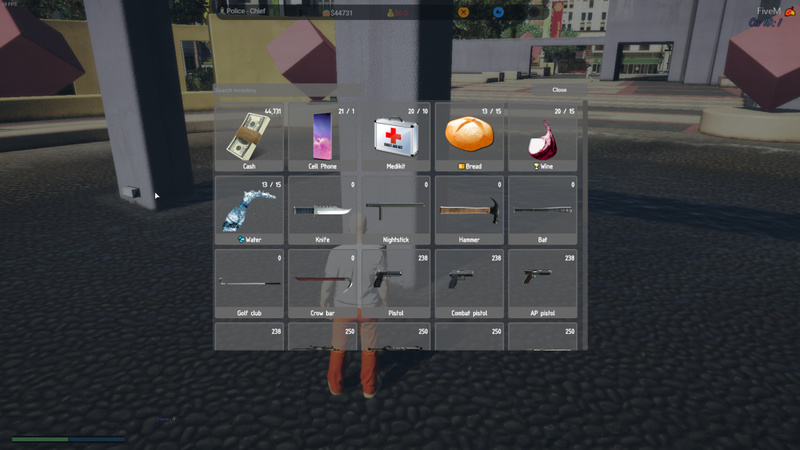 You can open and close inventory using F2. Right click item to list it’s actions. ESX inventory using HTML HUD. Contribute to Trsak/esx_inventoryhud development by creating an account on GitHub. Thanks @x20i for nice screenshot and item images. Currently includes cash, items and weapons. For me the screenshot does not load. Feel free to drag and drop the pictures to the topic. You aren’t forced to Upload it to imgur. Just released new version with config and locale files. So does it not pull anything from server side? How is this all client? Problem is, where you define all items and their pictures? Thanks for sharing it to the community! Its great, can’t wait for the update that allows giving items. Must have! Same way as the weapon thats there already. You can easily add your own item images. I highly doubt he will add anymore, as each server as its own items, all different.